In 2017 I graduated with my B.A of physical education from Brandon University. This spring I will graduate with my B.A of Education and will begin my career as a teacher. During my time at Brandon University I played a successful 4 years on the women’s basketball team receiving full scholarship each year. Being part of the basketball program I was able to give back to the community through various coaching opportunities. Through these experiences I was able to help youth be introduced to the game of basketball and develop their on-court skills. In addition, I was able to personally develop my coaching skills and gain experience which I will take with me as I move forward as an educator. During the summers I worked on campus at Mini University. I spent 3 summers at Mini U and was able to teach a variety of Physical Education camps as well as a drama camp. This also helped me develop professionally as an educator taking with me valuable experiences. I am from Winnipeg, Mb where I attended high school at Westwood Collegiate and later attended the University of Winnipeg. 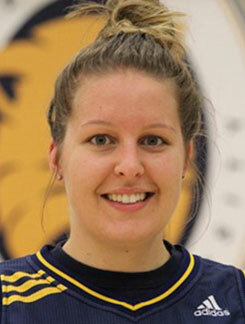 During my 3 years at U of W I studied kinesiology and theatre, I also played 1 year on the women’s basketball team. While attending school I was able to coach junior varsity basketball and assist with the Musical Theatre program at Westwood. After 2 years away from playing basketball I decided to make the move to Brandon University where I could complete my degrees and finish out my basketball eligibility. I grew up playing basketball and a variety of sports so I was introduced to coaching and teaching at a young age. As I grew up I had opportunities to coach basketball and which I really enjoyed. I also have a love for the performing arts which I was able to peruse during high school through Drama and Musical Theatre programs. For me it wasn’t a hard decision to go into Education, where I can combine my interests with my passion for Education. Upon graduation I hope to be teaching either in Winnipeg or Brandon. I would like to coach basketball at the high school level as well as be apart of the performing arts at the school I am working at. I would like to nominate Lauren Anderson for the recognition/honour of International Women’s Day exceptional female Brandon University student. Lauren is in her final year of the After Degree Program in the Faculty of Education. Lauren is a strong leader amongst her teammates, peers, and the teachers and students she interacts with. She is a very sought out teaching candidate from numerous schools in the region! Lauren is a graduating student-athlete for the Bobcats Women’s Basketball Team. Over the past 5 seasons, she has become a team leader and is considered the marquee player in the Bobcats Women’s Basketball program. Amongst her athletic leadership and accomplishments, Lauren has worked tirelessly at many Brandon University student endeavors. These include being a student leader in the Faculty of Education student orientation, (September ’18) and creating “Battle of the Cohorts” which helped establish a rapport amongst new students and helped ease anxieties of transitioning to a new Faculty/Profession. Lastly, Lauren has been a head instructor at “mini-U” and has made an impact on the young participants. Lauren has had success in her practicums, receiving exemplary recommendations from her Faculty Supervisors, Cooperating Teachers, and mentors. Lauren has shown a great commitment and passion to her post-secondary education and will be a an exemplary education leader wherever she goes.